12:21 PM There is a J.C. Black in the 1870 Census who was born about 1838 in Missouri and was married to Sarah (b 1838 in VA). They lived in Fairfield, Bureau, Illinois. Their children were Lockey (b 1860 in MO), James (b 1861 in ILL), Matilda (b 1863 in ILL), Sarah (b 1867 in ILL), Mary (b 1869 in ILL). In the 1880 Census J.C. Black (b 1838 in MO) lived in Tampico, Whiteside, Illinois and was married to Rebecca. Rebecca was born 1859 in Ohio. The children in the house were: Anna (b 1859 in MO and her mother was born in MO—she is the same age as Rebecca), James (b 1866 in ILL), Matilda (b 1864 in ILL), Emma (b 1867 in ILL), Elizabeth (b 1869 in ILL), Lottie (b 1871 in ILL), and John (b 1874 in ILL). The mother of all these children was born in Missouri, this indicates that Rebecca (who was born in Ohio) was not their mother. The J.C. Black in the 1880 Census is probably not the same J.C. Black who is in the 1870 Census because both families had children born in two of the same years with different names: 1867 (Sarah and Emma) and 1869 (Mary and Elizabeth). In the 1900 Census Rebecca J. Sollars Black (b Sept 1957 in Ohio) lived in Prophetstown, Whiteside, Illinois and was widowed. The father of her children was James C. Black, they were: Jesse L. (b 8 July 1885), Maude (b Feb 1887), Arthur (b Mar 1888), Floyd (b Oct 1894), and Mabel (b Nov 1896). 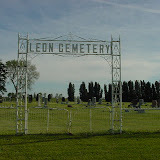 The Leon Methodist Cemetery in Prophetstown has a headstone for “Father Black” 1838-1896 which would indicate why in Rebecca was widowed. When Jesse L. Black died on 15 Jan 1964, his obituary (in the Daily Gazette of Sterling-Rock Falls) says he the son of James C. and Rebecca Sollars Black and he was preceded in death by, among others, a half-sister and a half-brother. I believe this half-brother is John W. Black (b 21 Jun 1873). This could be the John Black of the 1880 Census. John W. Black’s son was John Paul Black (b 4 Apr 1911, d 3 Dec 1932). In a scrapbook of Luther Carolson it says that John Paul Black was a nephew of Jesse and Arthur Black. John W. Black is my great grandfather. Is he the same John Black in the 1880 Census listed above? Any idea who his mother is?